Apartment with all the amenities in the middle of the Rastro, neighborhood surrounded by bars, restaurants, cultural atmosphere and close to Plaza Mayor, Puerta del Sol and Madrid de los Austrias, newly renovated with all possible amenities, fully equipped, toiletry as coffee, milk, tea and consumables for breakfast as deference, heating and air conditioning in the living room and bedroom, 2 tv. Bathroom with wide shower and enough closets so they can leave all your cleaning supplies and toilet. They have a hair dryer, gel, shampoo and towels. Property was located within a short walk of most sought after attractions in the center of Madrid. The apartment was clean, contained some helpful amenities such as an iron and ironing board, umbrellas, kitchen supplies and some food. We would definitely stay again! My wife and I stayed in the apartment a week. It was perfect for us, and we agree with all the comments of the other five-star reviews here on HomeAway. The apartment was clean and comfortable, and had everything we needed. Manuel met us when we arrived, and told us about the neighborhood and the sites in Madrid. The neighborhood is near two metro stops and lots of restaurants, cafes, bars and shops. You can reach virtually every major site in Madrid (including the Prado and the Royal Palace) within about 20 minutes on foot. Our only complaint was with some street noise late at night, especially on weekends, but I suppose this is an issue all over Madrid! (The noise was people, rather than traffic, because Encomienda is a narrow, mostly pedestrian, street). Thank you very much for your comment, and thank you for being such polite and friendly guests and take such good care of the apartment, leaving it clean and orderly, 100% formidable guests for future trips of this lovely couple, a greeting and hug, Manuel. Wonderful apartment in a great location in La Latina ! We loved our stay in this great apt. in the La Latino neighborhood. Manuel was so nice and the perfect host - he met us at the apartment and gave us tips on restaurants and activities in the area. So many bars and great restaurants to choose from and too little time to sample them all. He also had Madrid maps, brochures, and guide books (in English!) for us to use. The apt. is cozy (as you would expect in a big city), but it is bright and airy with plenty of windows. It is very nicely decorated, the bed and pillows are very comfortable, and the kitchen is well stocked with everything we needed. Manuel even had milk and orange juice in the refrigerator (with more for us in the cabinet), plenty of coffee, and a large basket of muffins on the counter - so kind and welcoming. The apt. is on the second floor, but the building has an elevator which came in very handy to get our luggage up and down from the apt. We loved Madrid and this apartment and hope to be back one day ! Thank you very much for your comment, I'm glad to know that everything has been to your liking and that you were comfortable in the apartment, great that you liked the neighborhood and Madrid, I wish you have a good trip, a greeting for the 2 Manuel. 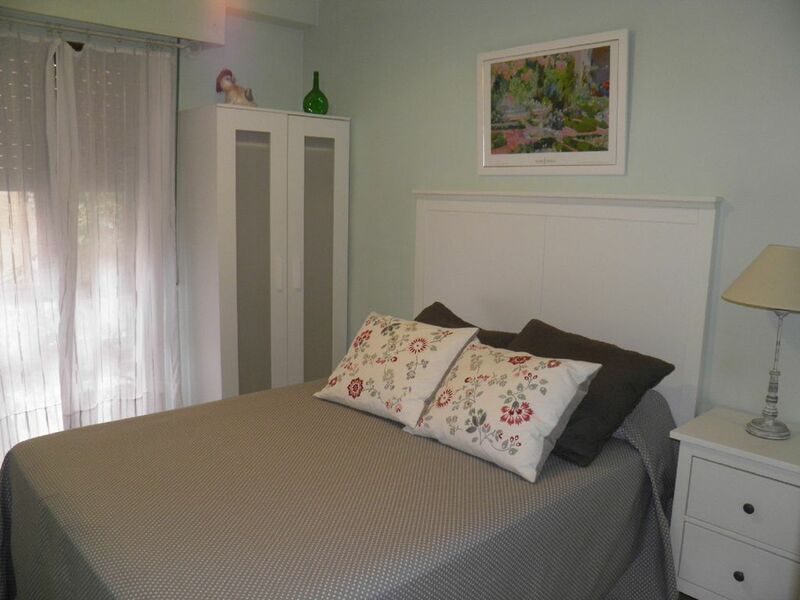 Apartment in the heart of Madrid Centro with many restaurants and bars. Ate tapas until our until we could eat no more. Thanks for the comment,I hope you a great tryp for Spain,best regards Manuel. Excellent apartment in a secure building. Great host. Thank you Manuel for our wonderful Madrid experience. Apartment located in excellent central location in close proximity to all major attractions, with grocery stores / bakeries within easy walking distance. Accommodations were clean, comfortable, very tastefully decorated. All our needs were met and then some. Manuel welcomed us with a lovely bottle of Red wine, juice, milk, water in the fridge, plus a loaf of bread and donuts to get us started. So thoughtful and appreciated. He then spent the remained of the afternoon giving us tips/maps/ brochures and advise on the attractions Madrid has to offer. An amazing experience. Madrid is a very vibrant city and Manuel helped us immerse ourselves and become part of it. Would strongly recommend. Fantastic host. Thank you very much for your comment, I am very happy to know that you liked the apartment, Madrid and the culture and gastronomy, a pleasure to have you as guests, a hug Manuel. The apartment is close to Plaza Meyor, and access to other major sites and metro stations is convenient. The size of the space was more than I expected. Manuel was easy to find and provided ample helpful information. I would absolutely stay here again and recommend it to people I know. Gracias por tu comentario Sean,me alegra saber que todo ha estado de tu agrado. Apartment in the Rastro, a few minutes from Puerta del Sol, Plaza Mayor, the Royal Palace, Almudena Cathedral, etc. Crowd of cultural leisure spaces also as it goes out to the street. Back for the Madrid de los Austrias and traditional Madrid. Possibility of making many visits to museums, shopping, bars, typical streets and main buildings; All this walking. Parking payment 3 minutes from the apartment.